I have been on a bunch of factory sites, industrial facilities, warehouses etc. and I really enjoy the experience of meeting the people, finding out their stories. As a photographer, I also get to see a lot of neat things and get access to places most people never get to see. One might not think seeing a mail processing at 4am isn’t much fun, I think it is just great. The goal of this shoot was to show all of the members of the union in the various roles they perform for Canada Post. There is a lot of moving pieces to get a letter delivered and these are the people that make that happen. 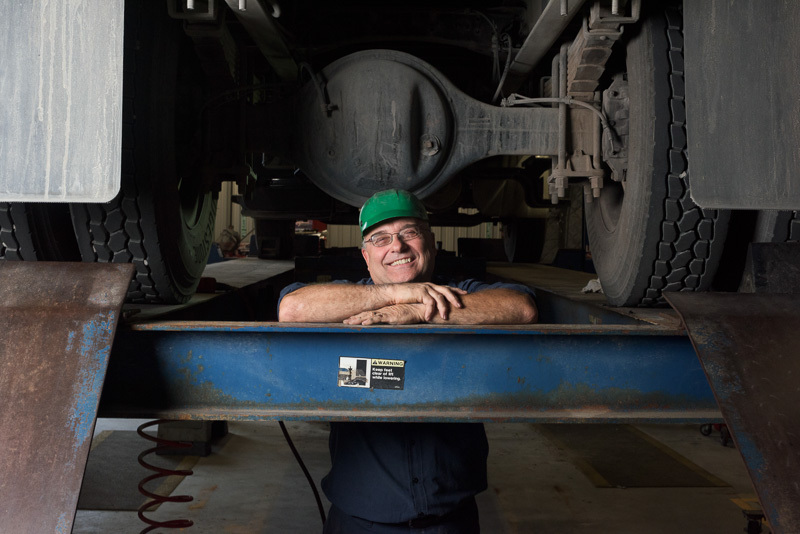 A mechanic works on a large postal truck on an industrial hoist. In this image I light the subject from the left of the frame to give the effect of the trouble lighting the scene. A mechanic poses between the tires. This image I am using a 45 degree angle of lighting and using natural light in the machine shop for fill. A mechanic overlooks a vehicle in for repair. Looking for interesting angles gives the viewer a greater sense of the environment of where the photo is taken. This is being light from the right to simulate the light entering from the overhead door. A mechanic poses in the machine shop.One light blended with the ambient light of the shop helps to isolate the subject while still showing the environment. This shoot was conducted over a number of days in both Winnipeg and Toronto. We traveled through numerous postal facilities and along routes the mail carriers service. I think we take for granted just what a massive undertaking that mail delivery is and how important it is. 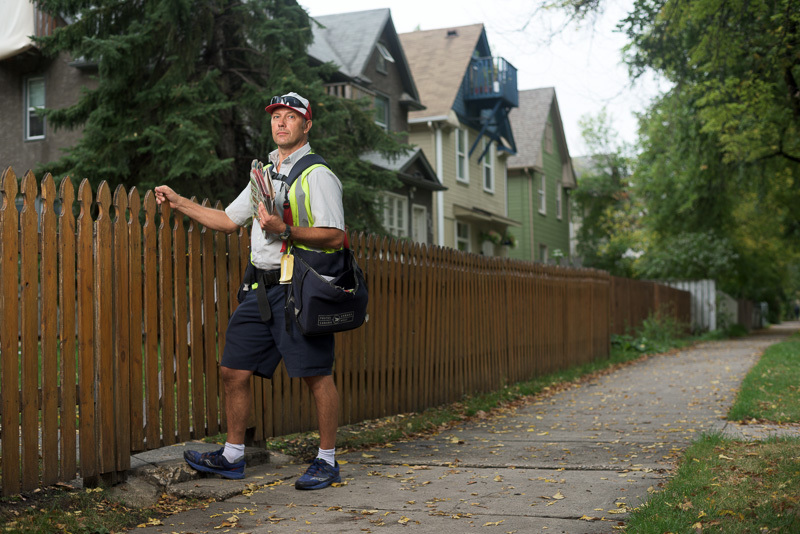 A mail carrier enters the yard of a residential neighborhood. In this image there is one light to the left of the subject. I wanted to add some contrast to an other wise cloudy day. A warehouse employee operates a small forklift. Using the existing light in the factory I was able to create a very dramatic background for this image. A worker cleans a large mail sorting machine. I used side lighting in this image to create contrast in the subject. A maintenance worker inspects a conveyor belt motor. I wanted to show the sheer size of the mail plant in comparison to the worker in this image. A forklift loads a truck containing parcels. This was shot with only available light. A worker poses for photograph in a mail sorting facility. A little bit of fluke, this image resulted during a conversation with two different employees. A mail carrier delivering mail. Using one strobe on battery power, I wanted to create a more dynamic image. I left some motion blur to convey movement in this shot. A worker loads the back of a mail truck with parcels. Front lighting with natural lighting in back. A mail carrier poses in front of a vehicle. A truck driver in front of Canada Post vehicle. Placing the driver directly in front of the truck gave a meaningful image. A letter carrier delivering mail in a residential area. Natural lighting was enough for this image, combining the truck in the foreground of the photograph and the subject further back. A worker next to the sorting line. A worker sorts mail at her station. A dock worker uploading a mail truck full of parcels. This was photographed at night, with lighting. Mail sorting on the night shift. One light a shallow depth of field created this image. A mail worker at a sorting facility. Complicated sorting equipment in the background shows the environment of the facility. A employee drives a forklift across a dock. I used lighting placed to the left of the subject to highlight her in the environment. A Canada post worker supervising a parcel sorting line. A slower exposure to blur the boxes and just fast enough to keep everything sharp. 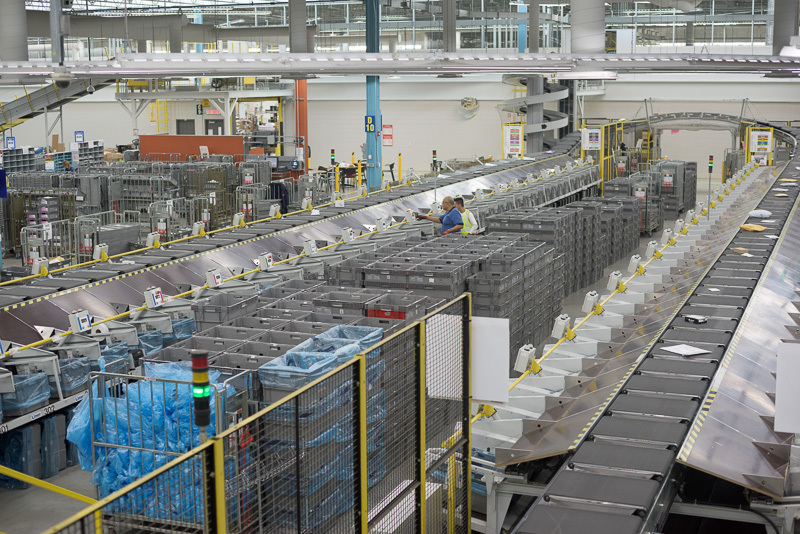 Workers oversee mail sorting equipment. The massive machines dwarf the employees who work with them. A postal worker operates a hand truck. I used one light on the subject to make the image pop. A mail carrier presorting mail before delivery. A cluttered environment leant itself to this editorial image. A postal worker sorts flyer at a postal facility. In a lot of these photographs I wanted to convey a sense of constant movement. That is why we see other workers and equipment surrounding the subjects. A mail carrier loads a truck for delivery. Sometimes it is ideal to overexpose the background to isolate the subject. Two workers working together on the night shift. A worker stops for a photo in the middle of a warehouse. I wanted the subject in the center of the frame to make use of the converging lines to create a strong compostion. You can check out more examples of my commercial photography in Toronto and Winnipeg by clicking this sentence.